Mandrel a serif with edge created by Jeremy Dooley and published by insigne which is available in 54 styles, 3 widths (Normal, Condensed, Extended) each with 9 weights (from thin to Black) with accompanying italics. Also it has a wide of OpenType features, 500 glyphs and over 70 language suppopt. It is characterized by Cap Height, x-Height and Decender. with strong serif and high contrast it merge well on editorial use, branding, display, logo, magazine, invitation but also on web. Enjoy! 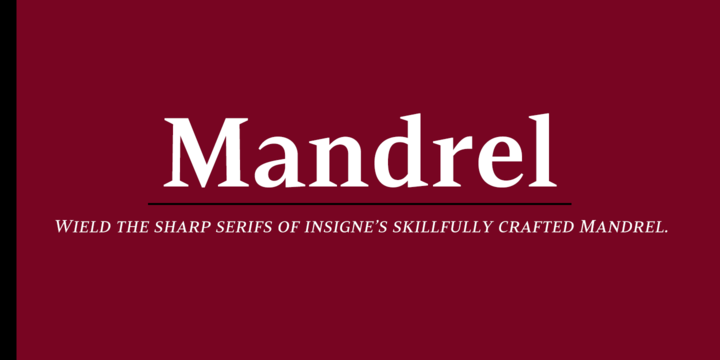 Note: “Mandrel” is a trademark of insigne. Price: starting from $35 for one font to $320,00 for all 54 fonts. A font description published on Tuesday, May 23rd, 2017 in Fonts, Insigne, Jeremy Dooley by Alexandra that has 2,920 views.